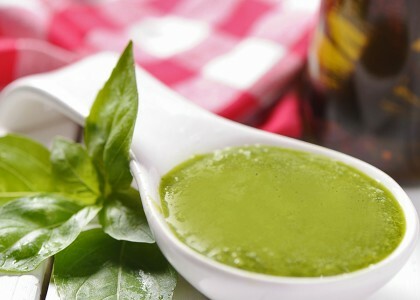 This pesto vinaigrette dressing with strong basil and parsley flavors, paired with the tangy lemon juice and hint of maple syrup sweetness is delightful with any type of salad! Set aside half of the basil and parsley. Place all other ingredients in a high powered blender and liquify. Add the remaining basil and parsley and pulse. Serve immediately over your favorite salad dish or chill for later use. The blend of flavors in this dressing is sure to make any salad taste amazing. There is a sweet, tangy flavor from the lemon and maple syrup blending with the fresh basil and parsley flavor. 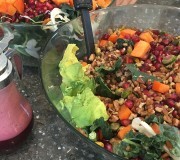 This dressing is perfect for kale salads and goes extremely well with a mix of Eatnuts.com Nuts and any number of Eatnuts.com Dried Fruits. Please reference Eatnuts.com Sweet Kale Quinoa Salad for an example. By combining the kale with some heartier ingredients like sweet potato and quinoa, you have a kale salad that can be enjoyed as a side or as a light entree. 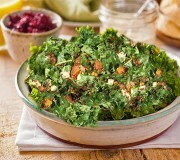 A hearty kale salad is always a great dish to have for a holiday spread. 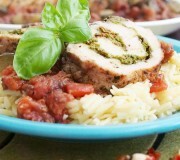 A delicious stuffed pork tenderloin featuring Eatnuts.com Walnut Pesto! A good pecan winter kale salad is the perfect addition to any holiday meal.